I've just started knitting a temperature blanket. It's late January, 2017 and you're all invited to join me. I've had lots of knitting ideas and thought this one could be fun. So what is a temperature blanket and how do you knit one? Great question. It's an easy knitting project that you knit over a year. All you do is knit one row per day for a year in a color that matches the temperature in your area. What colours you use will vary depending on the climate where you live. 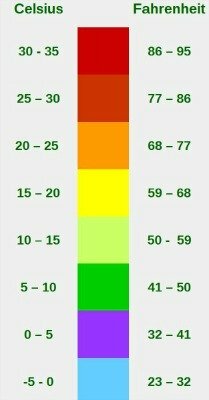 Here’s my temperature chart so you get an idea of what I mean. If you'd like to find other charts you can. Just Google temperature blanket charts and you'll find lots to work with or you can look up a temperature chart for you specific area and use that. There's a great website, www.wunderground.com and you can search for the temperatures in your area. Just find out what the highest temperature is for the day and knit the color for the temperature. You decide what temperature increments and colours you want to use. For instance my temperature chart is in 5 degree increments on the Celsius scale that is, but you can do whatever you like. I tried to use colors associated with the weather like red for hot and blue for cold. So far I'm using eight colours but still might add one or two more. Here's the colors I chose for my temperature blanket so far. 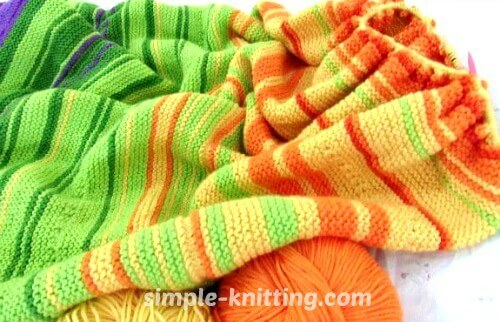 Just remember that it's your temperature blanket so work out the colors the way you like it. It's best to use a very basic stitch pattern for your blanket like Garter stitch or something else that's very simple. This way it'll show off the stripes better. I'm using Garter stitch because I want this to be incredibly simple. And for beginners, knitting a simple stitch pattern will make learning to knit a blanket so much easier. Plus you may already know this but I love knitting Garter stitch. Knitting blankets can be fun and easy to knit. If knitting gauge isn’t too important and this isn't, here’s how to get started knitting a Garter stitch blanket. Figure out how wide you’d like to knit your blanket. Multiply the gauge that’s on the yarn label by the width size you want for your blanket. Example: Gauge is 4.5 sts per inch X 40 inches wide = 180 sts to cast on. You'll need to use a circular knitting needle about 29 - 32 inches long to hold all the stitches. 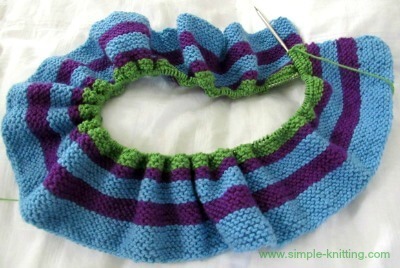 Now that you have the amount of stitches to cast on simply knit every row until you reach the desired length you want. And How Much Knitting Yarn Do You Need? I found a really cool knitting calculator from Jimmy Beans Wool to estimate the amount of yarn you'll need for many different knitting projects including blankets. I actually have the calculator over on my right side bar. It's a great knitting tool for finding out approximately how much yarn you'll need. To start off with I'd get one or two balls of yarn for each color. There will be some colours you use more often than others so you'll have to gauge it. For instance I bought only one ball of each for now but I'm getting low on two colours so I'll order more. If you're worried about the store running out of colors, keep in mind that you'll probably be able to find a similar color even if it isn't the same dye lot. There's loads of knitting yarns to choose from and as long as it's the same thickness you're good to go. Note: I want to make sure my temperature blanket will be long enough so I decided to knit two rows per day instead of one. I'm working towards a blanket size of 50 inches wide and over 70 inches long. If I only knit one row it will only end up being about 36 inches long and I want a snugly one. Actual Colors Used : They are all Cascade 220 Superwash Wool in the colors - violet, amethyst, green apple, lime, lemon, orange, pumpkin and really red. With color of the day knit Garter stitch to end of row. Continue knitting Garter stitch everyday and changing colors when necessary for the temperature. One Extra Note: If you’re not into knitting blankets you could always knit a temperature scarf instead using the same concept. Hi everyone, how's it going? I'm sorry I haven't been around lately. A lot of changes are happening even changes right here at simple-knitting.com! More coming soon on that one. How are you doing with your temperature blankets? I've got to tell you it's been a test for me because so many things have popped up this year. I have three knitting projects on the go and all with deadlines plus as I mentioned above other changes to my site have taken time away from my knitting as well. It's summertime here in BC Canada and it's difficult to pick up my wool blanket and start knitting and I have to admit I am a little behind. I'll get back on track though. I do enjoy the nice bright colors. I've made some color changes to my blanket too. I didn't like the blue so I took it out and used purple instead. Here's another temperature chart but without the numbers on them. I did list the colors I used under the picture to give you an idea. You can fill in the temperatures the way you like though. If you'd like to make the increments smaller you can so that you can have more colors and so on. My temperature blanket is just over 3 feet long now. I also decided to include a two row stitch pattern at the beginning of each month. I'm not completely sold on the idea but it's too late to change it so I'm just moving along with it. I sure love the squishy feel of the garter stitch. Well I hope you're all doing well with your temperature blankets and I'll be in touch in a couple of months. Keep going everyone. I know it's tough but you can do it. Wow I can't believe a whole year has gone by. I am sorry to say that I fell behind in my blanket knitting. So many unexpected things popped up but the main reason is that I'm going to be a grandmother again on Christmas Eve or so. Babies, after all come on their own time don't they? So I ended up spending a big part of my summer baby knitting instead. My goodness. You just never know what's going to pop up throughout the year. The nice thing about baby knitting is that I posted a lovely baby sleep sack knitting pattern. You may enjoy knitting it up if you are expecting a precious little one in your life. It's also a great idea for a baby gift. I haven't done a whole lot on it but it is coming along. And if you'll notice, there is a whole lot more orange than in the last update...haha It was a long hot summer. The blanket is about 3.5 - 4 feet long. It is a pretty little thing and it is definitely a fun knitting project. I just love those wonderfully bright colors especially now when the days are short and winter is on my doorstep. Because it's so late in the year I decided to make my temperature blanket a little smaller and try to finish up. The only thing is, I don't want to skip any months. Somehow I want to highlight the major temperature changes and shorten the amount of rows to knit. It would be for the months of October and November. I also plan on adding an I cord border. I love the way an I cord border seems to hold everything together and snug it up. 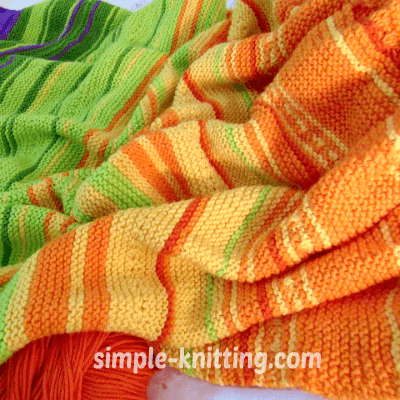 This is a great time to start thinking about knitting a temperature blanket if you want to start one in the new year. And just so you know it's also a great beginners knitting project too. As far as my blanket goes...well it won't be done by the end of the year but I will still post another blanket update when I'm done so you can see it finished up and pretty. I hope you're doing well with your blankets too, keep at it. I'm sure they'll all be lovely when you're done. I'll continue to keep you updated right here so you can see how my blanket is coming along.